This is an 11x14x3/4" original oil painting I just finished. 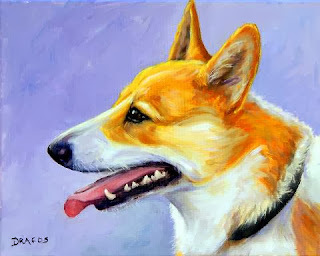 It's a Pembroke Welsh Corgi -- or just corgi for most of us. I feel I've finally gotten the feel of oil paints; and, honestly, I don't think I could ever, ever go back to acrylics now. I can't begin to describe the sensuousness of moving the oil paintings around on the canvas. The paints feel almost alive. It's just the most amazing feeling and experience I've had in art in a very long time. If you've ever baked your own yeast bread, you know that wonderfully indescribable texture and loft of the perfectly kneaded bread dough. I know they're two totally different things, oil paints and dough, but I get that same kind sensation with both of them, an aliveness that is exhilarating and awe-inspiring! Okay, okay, I know I'm getting a bit carried away here, but I'm really enjoying painting with oil paints. 'Nuf said! Regarding my quest to go to La France, I'm inching forward: I am signed up for a short course of intense language study in December and am taking a full-length course starting in January. Yesterday evening, I participated in my first group discussion among mostly Francophones and a couple of Francophiles (me included). It was a lot of fun; a great group of people. Here she is! 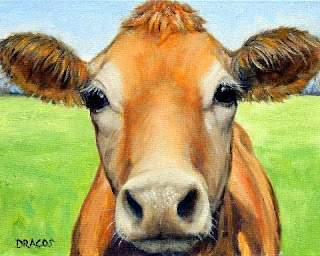 She was standing in a field near Corvallis, OR, along with many other cows, all Jersey milk cows, at a small organic farm. Like all the other cows I saw that day, she was a sweetheart, very curious about what I was doing out in the field with them. Both the original and prints are available. The original is an oil painting on an 11x14x3/4" canvas. It's good to be back painting again. I missed it. And I'm working pretty much only in oils now! It's been a very slow learning curve, and I have a lot to learn yet, but I'm moving along on it now.